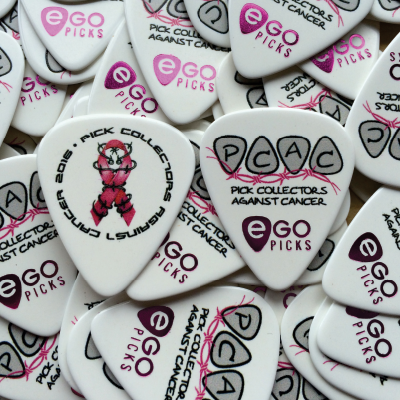 EGOpicks is a proud partner and supporter of PICK COLLECTORS AGAINST CANCER… a very special community of Bands, Musicians, collectors, and music lovers, that work together to help raise money for cancer charities all around the world. 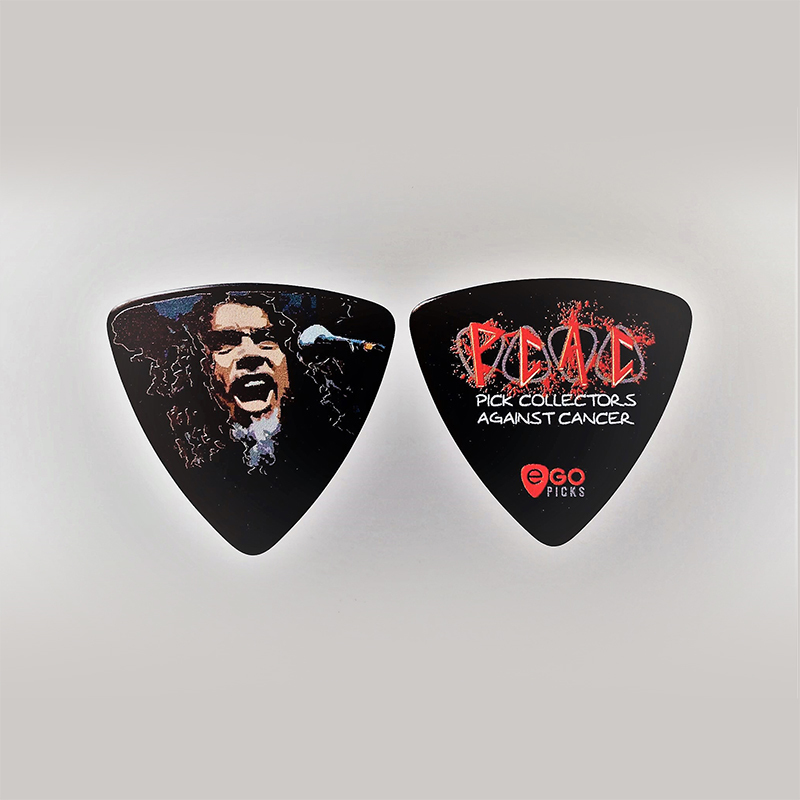 Pick Collectors Against Cancer was formed in September of 2015 by Lee Hutchinson. 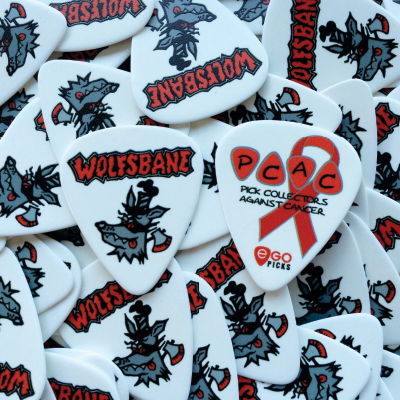 Inspired by his love for pick collecting, and his passion to help others, Lee wondered how he could combine these two things to raise money for charity. After Lee’s own mother fought a lengthy, but victorious battle with cancer, Lee decided that he wanted to show his gratitude and find a way to give back to the people and the facilities that helped his mom. 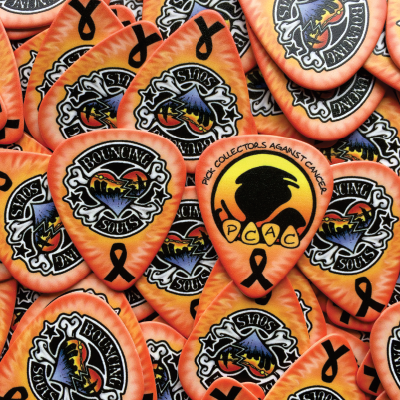 It all started with Lee’s idea of creating a special set of guitarpicks, that he would offer to the many pick collectors that he had come to know through his many years of pick collecting. 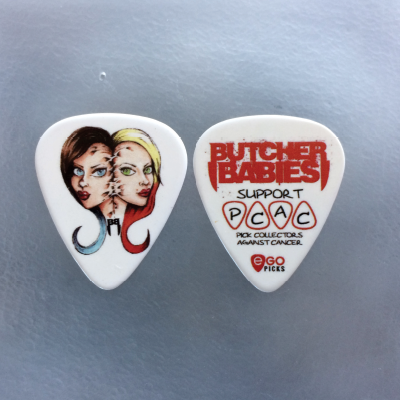 Lee reached out to designers and pick companies to help out, and the result was a stunning custom pick set that sold out quickly, and raised $2000. 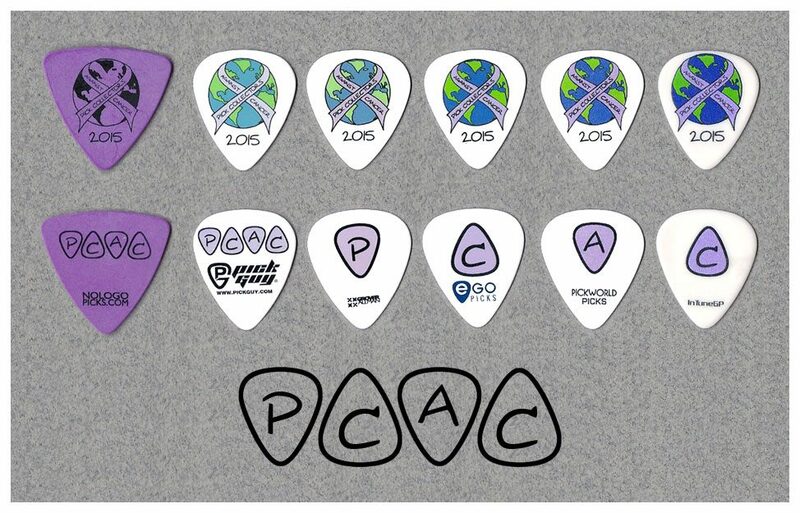 Since then, Lee and PCAC have attracted the attention of major bands and artists from all over the world – and they’ve been more than willing to help by either donating personal or tour items to be auctioned off – or by agreeing to have an exclusive ‘Band/PCAC’ pick designed for Lee to make available to the PCAC community, and of course, the band’s own fans. 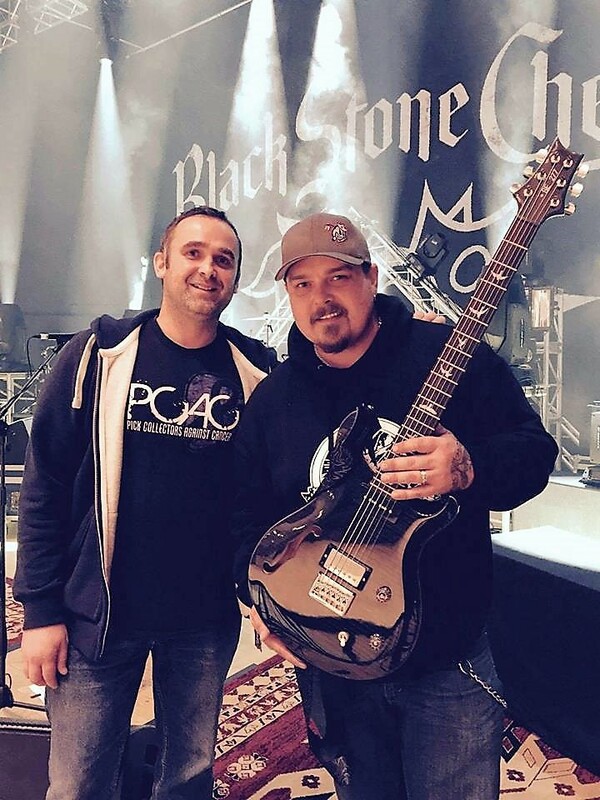 The bands and artists are even welcome to name the beneficiary of the monies raised from their auction items or Band/PCAC picks – so the list of charities that PCAC has helped, continues to grow. It’s truly a feelgood experience for all involved. 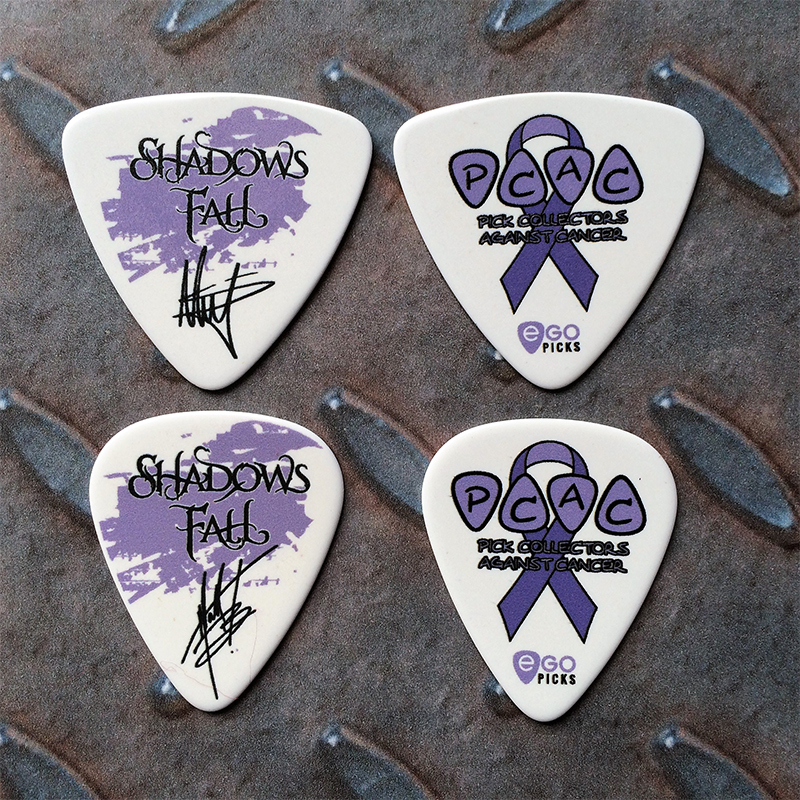 Bands and artists like New Found Glory, Black Stone Cherry, Shadows Fall, Butcher Babies, Anthrax, Sandra and Tom Araya, and Mastodon – just to name a few – have really jumped on board to help Lee in big ways – not only with their item donations and Band\PCAC picks – but also with their support in spreading the word about PCAC through photos, interviews, and sharing PCAC information and auctions on their social media pages. 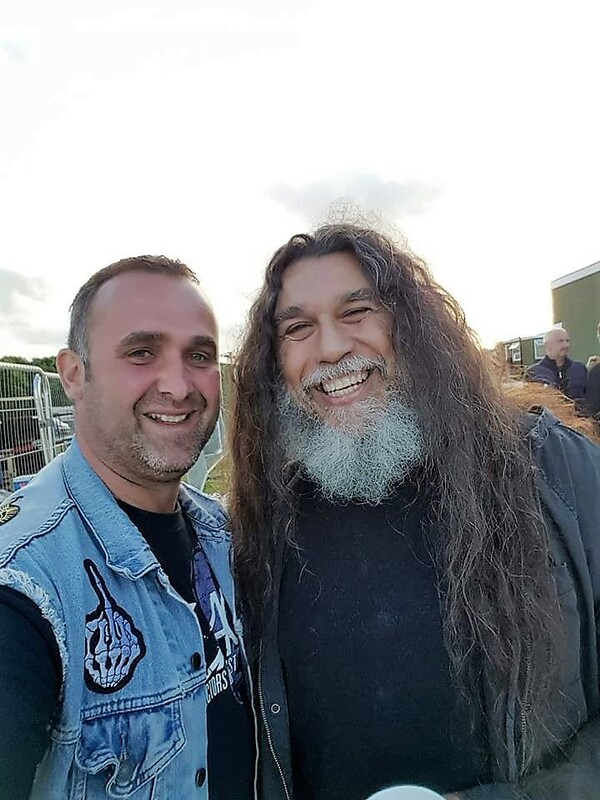 Founder Lee Hutchinson with Tom Araya of Slayer. 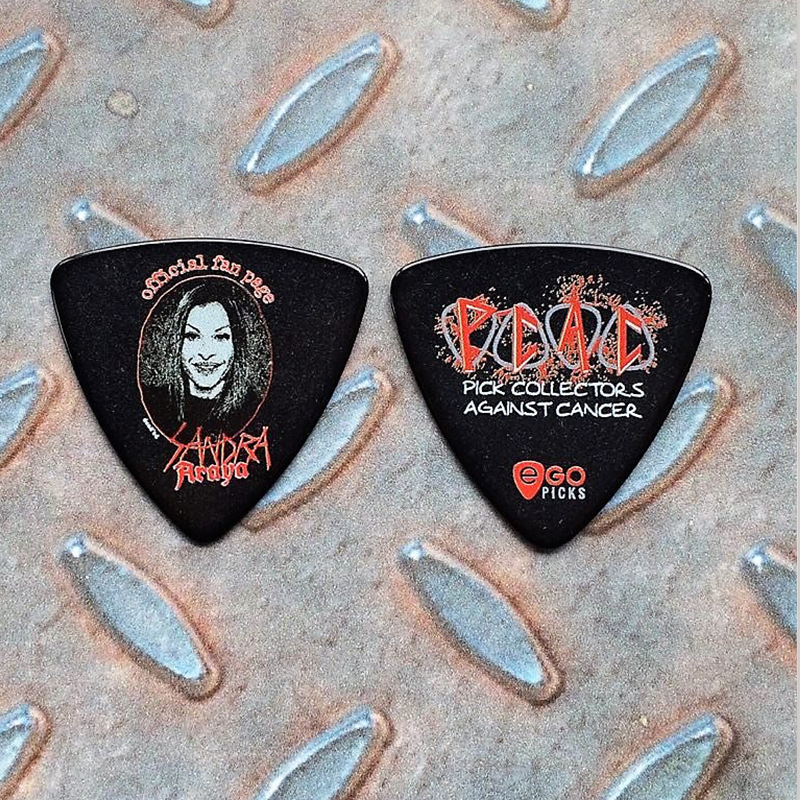 Tom and his wife Sandra Araya have both been huge supporters of PCAC – each releasing special edition PCAC/ARTIST picks. 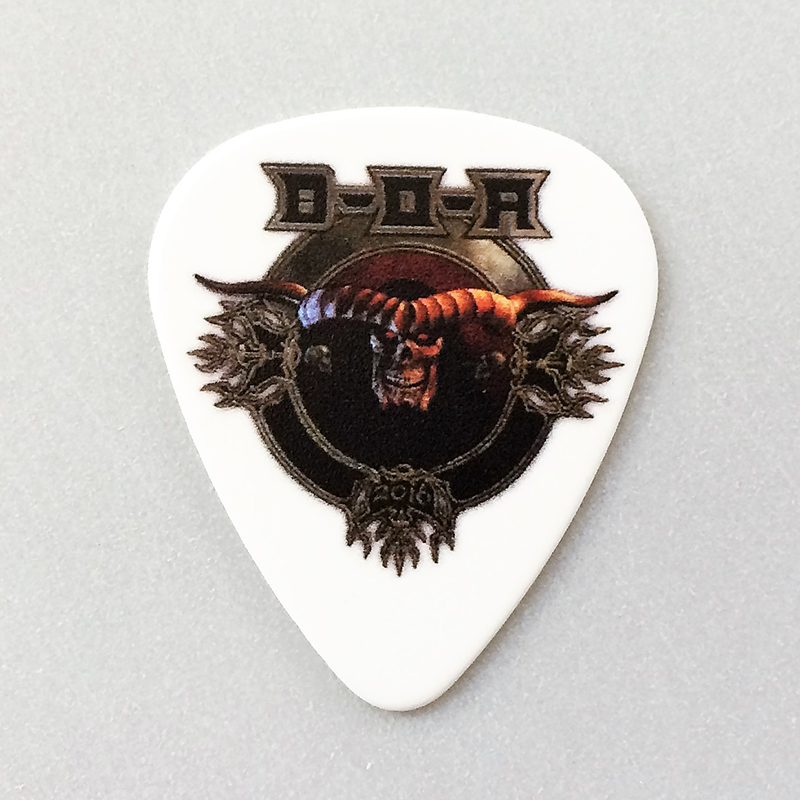 Needless to say, their picks sold out in record times. 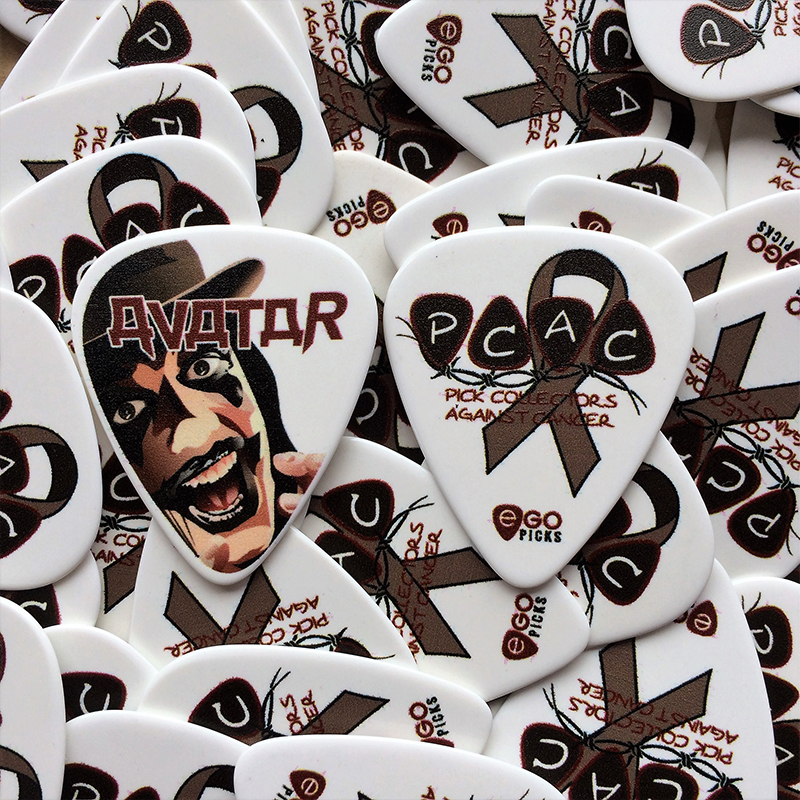 Between the item auctions, and the special edition Band/PCAC picks that have been released, PCAC and it’s vast community of supporters raised over $23,000.00 for various cancer charities around the world – in it’s first year alone! 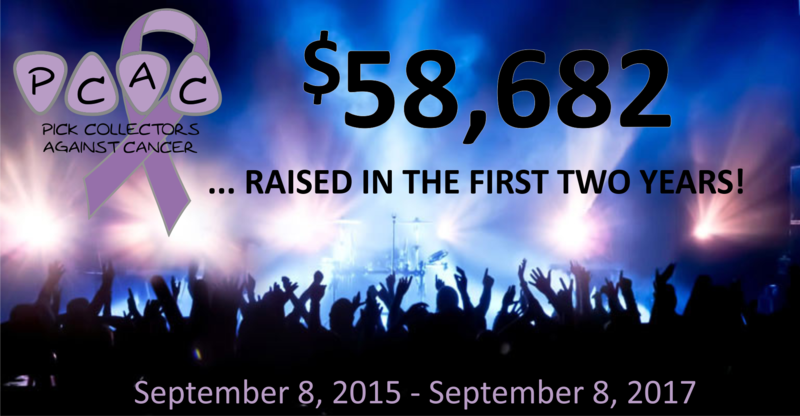 Now just shy of PCAC’s 2nd Anniversary, that total has now grown to over $50,000. who have banded together to do some pretty amazing things for Cancer charities. 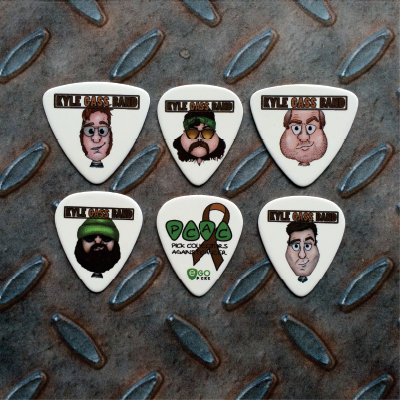 They are truly like one big world-wide family, and they all do whatever they can to help Lee with his mission and passion to raise money for cancer-related causes. Who knew little pieces of plastic could have started such an incredible impact on the world? Ironic, right? With non-stop, mind-blowing auctions, contests and releases of limited edition artist items, anyone is invited to join the community and participate in the exciting events.